Don’t know where the time has gone, but Eliza is now turning the corner toward 4. 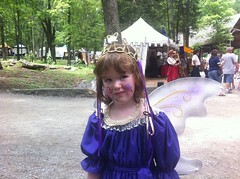 She’s still really into dress up (as you can see in this pic from the Renaissance Fair). She loves kitty cats, real or stuffed. She is really into Scooby Doo movies and watches at least one every day. And she has developed a hilarious sense of humor. There’s nothing like her smile to light up the whole world. She has taken dance class, swim lessons, and had play dates, stayed with Nana and Pop Pop for extended periods of time, and traveled to many fun places. She’s quite the big girl now, as she likes to remind us.